It’s difficult to review an experimental fiction novel. What David Levithan provides here are film slides ordered randomly. Beautiful, yet mundane. We live through it ourselves. The story contained between the softcover is one we’ve lived through, currently living through, will live through. Something worth reading once, but I can’t imagine picking it up again (unless there are more break ups in my future). How does on talk about love? Is it even possible to describe something at once utterly mundane and wholly transcendent, that has the power to consume our lives completely, while making us feel part of something infinitely larger than ourselves? 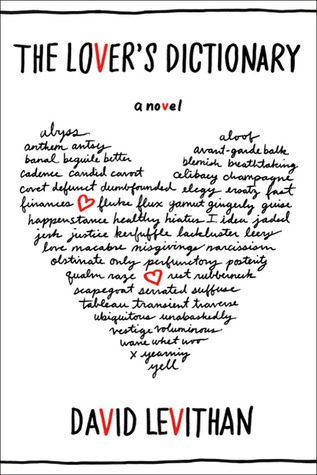 Taking a unique approach to this age-old problem, the nameless narrator of David Levithan’s The Lover’s Dictionary constructs the story of a relationship as a dictionary. Through these sharp entries, he provides an intimate window into the great events and quotidian trifles of coupledom, giving us an indelible and deeply moving portrait of love in our time. The Lover’s Dictionary is available on Amazon (for Kindle) and Barnes & Noble (for Nook).